The western shore of the island of Hawaii, also known as the gold coast, is a place of remarkable beauty, excellent weather with plenty of sunshine, and perfect for relaxation and tranquility. My favorite is the stretch between Waikaloa, just 19 miles north of the airport, to Kohala. A day trip is certainly possible which affords stops at several tranquil locations. 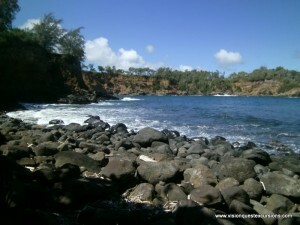 Heading north on Highway 19, our first stop is the Hapuna State Park near the Puako Bay. Take a left off of 19 towards Puako, and then take the first right. The road narrows and soon you will come to a sign designating the park, and the parking area is an immediate left. There is a $5 fee to park here which can be paid at an automated kiosk. The beach here is smaller than the main beach a little farther north, but absolutely amazing and a perfect place to sit and relax, swim, read, or meditate. The many trees make for secluded areas and this section of the beach is my favorite. 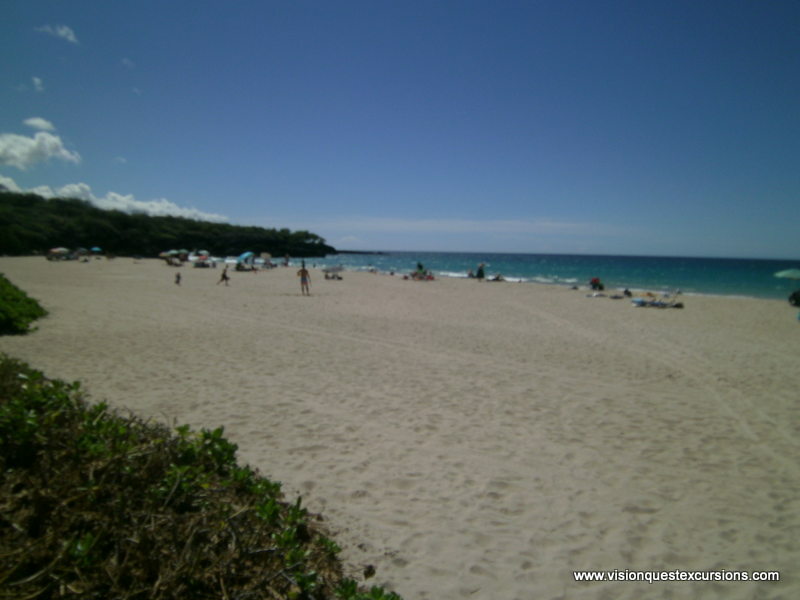 After spending an hour or two in the morning, head further north on 19, noting the turn off to Hapuna State Park beach along the way, we will stop here later in the afternoon during the return. As 19 comes to a stop sign, take highway 270 which is the coastal route. Along the route stop and see Lapakahi village which is near mile marker 14. 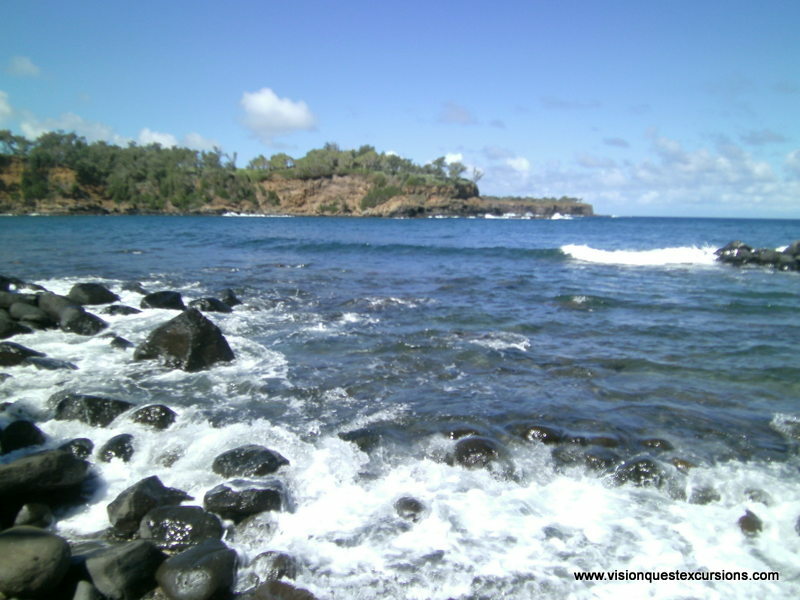 Lapakahi is an historical Hawaiian fishing village and plan to spend about an hour here. There are two loop trails, each about a half mile each which will take you around salt making pans, the habitation complex a canoe halau and along the shoreline of Koai’e cove. The site offers a glimpse of how the early settlers of the area off of the bounty of the sea. A short distance up 270, our next stop is Kapaa Beach Park. Beach is a bit of a misnomer as there is no sandy beach here, and the shoreline is rocky. The beach is nevertheless breathtaking with magnificent blue water gently crashing along the shore. The water here is swimmable, as we saw a few snorkelers out in the water. However, exercise caution as entry and exits can be difficult and there are currents here. After spending some time, continue on and come to the town of Hawi. This is an old, historic town from the boom days of the sugar cane industry, which now has revitalized itself with various tourist industries. There are shops and a gallery here, as well as Bamboo restaurant which is arguable the best food on Hawaii. There was certainly time to stop and browse the shops. We continued on to Kohala, and made our last stop at Keokea Beach Park. The park is nice, with a large lawn area for sunbathing along the rocky shoreline. There are picnic areas and restrooms available and this is a great place to spend a little relaxation time. I’m sure it must be busy on the weekends, bit we were there on a weekday and only one other group was there who appeared to be locals. Swimming is problematic as entry into the cove is very rocky and treacherous, although it may be possible via the boat ramp. We headed back into town to grab lunch and stopped at the Courtyard Deli in the old Nambu building. The deli makes excellent fresh sandwiches, Panini, and has a serene courtyard out back to sit and eat. 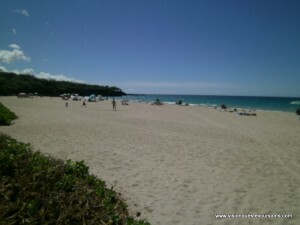 After lunch, we headed back and stopped at Hapuna Beach Park for the afternoon. This beach is beautiful, white sand with a gentle surf and warm, swimmable waters. The beach is among the top ten beaches in the world and a must see. There is an attendant here collecting parking fees of $5, but if you show the receipt from the stop earlier in the morning you will not need to pay again. The park has a snack bar, shower and restroom facilities, a beach rental area and picnic areas. We spent several hours here before heading back to our hotel to decide where to go for dinner, which incidentally was back up the coast to Hawi where we dined at Bamboo. There are of course many other places to see and things to do along the gold coast. This is just one possible itinerary and makes for an enjoyable day.